Some birds prefer to build nests in trees or simply nest in tree cavities. One species, in particular, prefers to build a nest out of mud on the side of an outhouse. Searching along the banks of a river for mud may sound like a dirty job. However, if you are a cliff swallow (Petrochelidon pyrrhonota), it’s simply a way of life. Cliff swallows find mud and gather it in their bills to use as the primary nest building material. The swallows bring the mud pellets back to the side of a cliff, cave, or even a man-made structure (in Yellowstone, they like outhouses) to construct a conical, gourd-shaped nest. What’s the point of collecting mud and other debris to construct an odd-looking nest? Why do cliff swallows prefer to build these types of nests in colonies? To begin to answer some of these questions, it is important to look at the reason(s) for having nests. There is a huge amount of variation in nest design among animal taxa. Some mammals dig burrows, fish construct craters, and termites build mounds. Within the bird family, the there is still quite a variation. Even though the design is different, all nests basically serve as a place where animals lay eggs and/or raise their young. 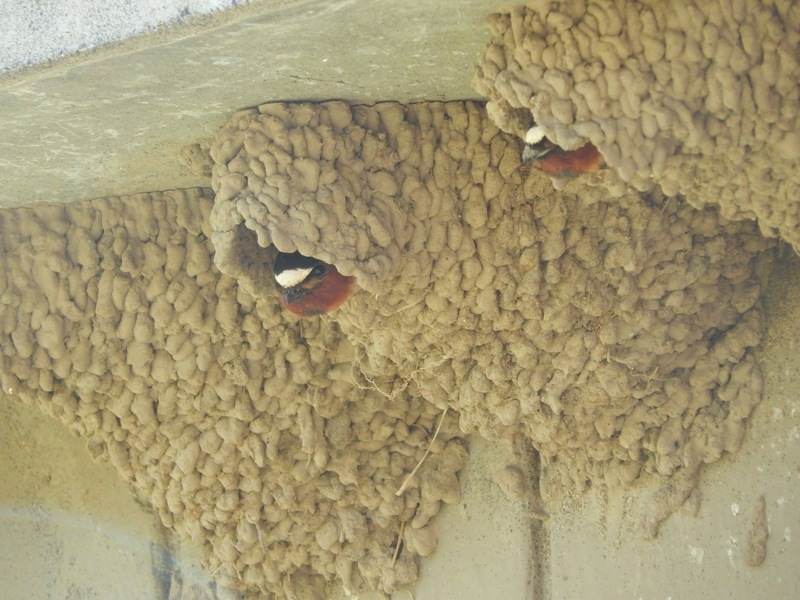 Why would cliff swallows go through all the trouble of building a gourd-shaped nest attached to the side of a building in close proximity to other nests (in a colony)? What is the role of natural and sexual selection in nest building? Do environmental factors influence construction? Nests can certainly impact the fitness of individual birds. The greater the fitness of an individual, the greater the chances of surviving and reproducing. This is seen in several ways. First of all, the location of nests as well as the design of nests both contribute to predator avoidance. Also, building nests in a colony can increase social interactions which, in turn, can increase the chances of survival. These strategies show that natural selection exerts strong selective pressures on the design and placement of nests, but natural selection does not explain it all.